This series of posts tells the story of my trip to Iona in July 2015 with 3 other artists and a film crew. We went to explore an idea we call ‘Wild Curating’. The background to this project can be found here and part 1 of the story here. If, like me, you are an introvert then you will know the sense of dread that accompanies communal living. The monsters that we fear are so personal. The second day on Iona was a Sunday and I preached a sermon in the abbey, full of people from across the world. Whilst public speaking is often high on the list of peoples’ greatest fears it doesn’t bother me much at all. However, when living amongst the community at the Abbey the prospect of sitting with a stranger at dinner and being expected to make conversation, particularly when I was at such a low ebb of energy, made me want to run and hide. This sounds ridiculous to me as I write it; the Iona community are an amazing bunch, the volunteers, guests and staff are kind, generous spirited and friendly. Nevertheless, I’d rather stand in front of a thousand people to give an impromptu talk without notes than sit with a group of people I barely know and be expected to make small talk over ratatouille, not least because I’d hate my silence to be interpreted as a dislike for the people around me. Suffice to say, after a couple of days of the traumas of travel, Scottish rain and communal living on an exposed scrap of land that felt so far from anywhere familiar, I was in need of sanctuary. And just when I thought the final thread of the frayed rope was about to snap I found it in the Abbey’s Chapter House. The other artists had set off around the island to scout out locations that inspired them but I stayed within the solid stone walls. As the rain came once again, driven against the windows, I unrolled the watercolour paper I had brought on the trip. With the door closed and my headphones on I started to paint. I finally felt safe as the monsters of my own dreaming were barricaded outside, I could feel my shoulders relax and my soul unfurl. The utter elation of the freedom that solitude brings. As my music played I knew the warm glow of being truly at home. Rarely have I used paint with such life and vigour. The brush flicked and swept with abandon across the pristine white as colours splashed and flowed. This is the sanctuary of the studio, a cocoon where engaging with life, mess and disorder leads to transformation and new life. My plan was to produce a series of watercolour paintings that I could take out around the island, to allow the elements to interact with the paint. To try and share with the island in the creative process. I thought that the images I made that afternoon would come out half formed, with something missing and that that dissatisfaction with what I had produced would encourage me to take them out and submit them to the vagaries of the Hebrides. But as the pictures emerged I realised that I loved them. When I paint at home I use oils, they take time: weeks, even months but watercolours are lithe and capricious. The quick paintings I made there encapsulated the life and joy I felt in that warm sanctuary space after a tough few days. And so, as the afternoon drew to a close and the dinner bell rang I surveyed the work and felt a connection, the pang of ownership, that here was something of me, something precious that I wanted to keep safe and not open the door to take them to the monsters waiting outside. This was another moment of decision and a definite choice. I could keep the paintings safe, even bring them back home and show people what I had made on our trip to Iona or I could send them out as a sacrifice to the gods of stone, sea and sky. It made me think of St Columba who has washed up on the shores of the island so many centuries ago, alone and exposed. A painting, when it is made honestly is a little fragment of the soul and the decision to offer that up and to expose it to the big bright sky was a moment of liberation. An admission that, as much as I long to be in control and even live under the illusion that I am, the forces that shape the universe are beyond me. This liberation brought the realisation that the only monsters on the island were the ones I had brought with me. As much as dark rain clouds filled me with dread that disconcerting feeling was from me and not from them. When it falls the rain is simply being what it is, the rocks are being rocks, and the tide is flowing as the tide. The struggle only starts when I want them to be something that they are not. 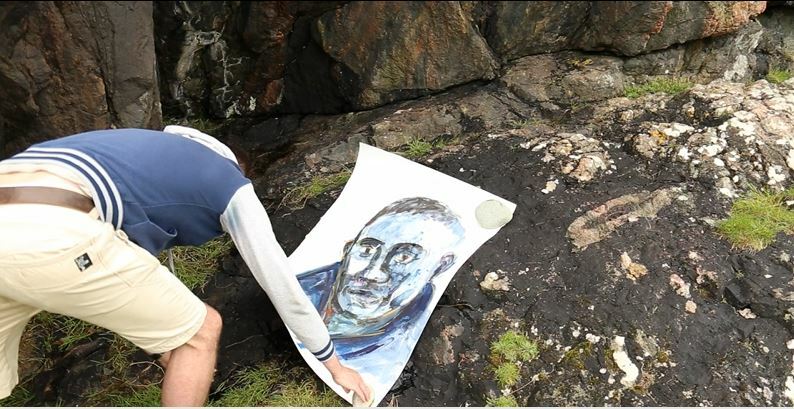 A painting of Myles, our sound technician, I put under overhanging rocks at Columba’s Bay where the Saint landed all those years ago. The drip drip of water filtered through the earth and rocks above made tears stream down his face and the dark blue paint began to move and flow. 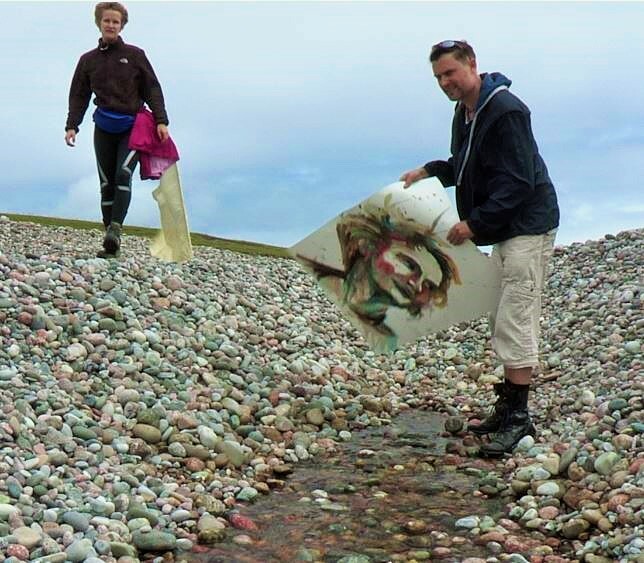 A painting of Naomi one of our artists, I put in a river running over pebbles on the beach at the machair which was swollen by the rain. The water moulded the paper to the contours of the rocks making troughs, valleys and a whole landscape from her face as she gazed up at the stars from underwater. A drawing of Andy, Naomi’s fiancé, I gave to her to use in a performance piece and she took him to Columba’s bay to create a beautiful, holy moment. A painting of my own fiancé Paul I kept safe, because some things I’m not prepared to give up. And the final painting, of Elisabeth, now shines beneath the earth. The reason for her burial is the story of the most heartbreaking challenge we faced all week. I’ll tell that story in the next post. I am enjoying your postings about Iona. I am a regular visitor and have stayed at either the Abbey or the Macleod Centre every year since 1997. Some years I have made two visits. So I am very familiar with the extrovert nature of the experience. In fact it is one of the reasons I go. If you and I sat together for a meal I would relentlessly press you about âWhereâs your home?â, âHave you been before?â, âAre you with a group?â. I love the challenge of making conversation with strangers. I hope I would do it with sensitivity but I need the outlet from time to time in what is otherwise quite an introverted and contemplative life. I try and spread myself around the group during the week, so you might only have to suffer me once! Next month my wife Wendy and I will make our second visit to Iona this year. We had a week together in The Argyll in May but I need my âfixâ of extrovert life at the Abbey/Mac. Wendy will stay at The Argyll Hotel on her own. She finds the prospect of life in community too overwhelming and insists on her own company. So at the top of the jetty we will part company. She will find sanctuary in a single room with a private bath in the hotel and isolate herself from nosey extroverts at mealtimes with a book. I will join the excited throng that chatters its way through the Nunnery, up the hill past the Columba, Orinâs Chapel, through the gate under the gaze of the guardians of Historic Scotland and into the echoing refectory of the Abbey. Wendy and I will check in with each other occasionally during the week, possibly share a meal at The Martyrsâ Bay or a picnic in the rain, but otherwise we experience the island apart. We will reconnect at the top of the jetty on the following Friday and enjoy sharing our stories of solitude and community on the journey home to Northampton. Your posting had an interesting impact when my phone bleeped to announce its arrival. I was sitting in a desolate mood in my studio on the outskirts of Milton Keynes. I use the word studio loosely. I donât want to give the impression that I am a practising artist. I occupy one of six almshouse studios maintained by Milton Keynes Art Centre. In retirement I am experimenting with trying to âfind my inner artistâ. I play with green-wood and willow and anything else that catches my fancy. I donât exhibit or sell anything. I am just playing. For the past few weeks I have felt particularly empty and disheartened – completely unable to play, thoroughly stuck and feeling sorry for myself. Over the last few days the other studio occupants have been away, it has been raining and my gloom has deepened. The bleep of you incoming email was a small experience of joy! Which is why I am prompted to force my attention on you and write a response. Your reference to introversion and your experience on Iona made me realise how much I need connection to others and feel abandoned when isolated. At that point Debbie, my studio neighbour turned up, back from holiday and full of ideas about a collaboration with her artist friends, among whom, flatteringly, she includes me! All of a sudden I came alive. It felt like that desert in the USA that suddenly blossoms when it rains once in ten years. So the conjunction of my gloom, your posting and Debbieâs project made me realise how important it is for me to work with people, but more than that, I need times apart to wind up my spring to give me energy. Also, writing this to you has made me appreciate how much I need to connect with others who possibly see the world through a similar lens. I wonât drag this on any further, but did you hear Lucy Winkett on âThought for the Dayâ yesterday http://www.bbc.co.uk/programmes/p030rrvh ? She spoke about Ignatius and desolation and consolation. Itâs worth a listen. With warmest thanks for touching me in the right spot. Thanks for your post, it’s really good to hear some of your story. And I’m sure if you sat with me at dinner in the Abbey we would have a fruitful conversation (just don’t try it at breakfast time!). I did hear the piece on thought for the day yesterday and found it very helpful. Ignatian spirituality has been one of the foundation stones of my faith journey for a while now and it seems to me that the idea of consolation and desolation (as well as the subtle and harder to discern ‘false consolation’) are very powerful tools in helping us to go deeper. They are so helpful as we navigate these uncomfortable moments, which as you’ve pointed out can be so different for extroverts and introverts. It seems to me that there is something important about befriending our shadow side – so, for me, holding in prayer the discomfort I feel about being in community rather than just dwelling on what I feel is my comfortable natural inclination leads to a deeper and more challenging transformation. It doesn’t turn me into an extrovert but it does mean that I can *be* in the right way when I am in community. Thanks again – and every blessing to you in your creative adventures!